Preseptal cellulitis. This image shows an 8-year-old patient who presented with unilateral eyelid swelling and erythema. Preseptal cellulitis tends to be a less severe disease than orbital cellulitis (postseptal cellulitis), which can have a similar initial presentation. Preseptal cellulitis differs from orbital cellulitis in that it is confined to the soft tissues that are anterior to the orbital septum. Orbital cellulitis has a higher morbidity, requires aggressive treatment, and may require surgical intervention, whereas preseptal cellulitis usually is managed medically. Delineation of the exact location of inflammation is necessary for proper diagnosis and treatment. (See Prognosis and Treatment.) Pain or limited eye movement, chemosis, afferent pupil, or resistance to retropulsion indicates orbital extension of the infection. Periorbital inflammation is classified by location and severity. One of the major anatomical landmarks in determining the location of disease is the orbital septum. The orbital septum is a thin membrane that originates from the orbital periosteum and inserts into the anterior surfaces of the tarsal plates of the eyelids. The septum separates the superficial eyelid from the deeper orbital structures, and it forms a barrier that prevents infection in the eyelid from extending into the orbit. Patients should be instructed that loss of vision or pain with eye movements is an indication that the infection has spread to the orbit and may necessitate surgical intervention. Increased edema and redness or pain in general are also warning signs. For patient education information, see the Diabetes Center, as well as Cellulitis. Direct inoculation and spread from adjacent tissues can cause preseptal cellulitis. Upper respiratory tract infections, especially paranasal sinusitis, commonly precede orbital cellulitis and some cases of preseptal cellulitis. In 2 large case series, nearly two thirds of cases of cellulitis were associated with upper respiratory tract infection. One half of these cases were from sinusitis. The most common organisms are Staphylococcus aureus, Staphylococcus epidermidis,Streptococcus species, and anaerobes, reflecting the organisms that commonly cause upper respiratory tract infections and external eyelid infections. Blood and skin culture results tend to be negative. Prior to the introduction of the Haemophilus influenzae type b (Hib) polysaccharide vaccine, in 1985, H influenzae was the most common organism isolated in blood cultures. [1, 2, 3, 4] One study prior to the introduction of the vaccine noted that blood culture results were more likely to be positive (42%) if the patient had an upper respiratory infection and that subcutaneous aspirates were more likely to be positive (44%) if the patient had eyelid trauma or external ocular infection. Since the vaccine came into widespread use, the rate of Haemophilus -positive blood cultures has dropped; studies have reported that the rate of any positive blood culture is now less than 4%. The reason that the rates for bacteremia for all organisms have dropped is unclear. A study specifically looking at periorbital and orbital cellulitis since the advent of the vaccine likewise found that the rates of Hib-related cellulitis dropped, from 11.7% to 3.5%. Total cases per year from all pathogens also declined, suggesting that H influenzae may have played a facilitative role in the pathogenesis of cellulitis. According to the National Center for Disease Statistics, in 1995, approximately 5000 inpatients in the United States had a primary discharge diagnosis of deep inflammation of the eyelid, as specified in the International Classification of Diseases, 9th revision (ICD-9). Preseptal cellulitis is primarily a pediatric disease, with approximately 80% of patients being younger than 10 years and most patients being younger than 5 years. Patients with preseptal cellulitis tend to be younger than patients with orbital cellulitis. If preseptal cellulitis is identified and treated promptly, the prognosis for complete recovery without complication is excellent. Morbidity occurs from the spread of pathogens to the orbit, which can threaten vision and result in central nervous system (CNS) spread. Untreated orbital cellulitis can lead to the development of an orbital abscess or can spread posteriorly to cause cavernous sinus thrombosis. Systemic spread of bacteria may lead to meningitis and sepsis. Patients who are immunocompromised or diabetic have a higher likelihood of developing fungal infections, which can rapidly become fatal. Aggressive management, including imaging studies of the brain and early IV therapy, along with a high index of suspicion, is indicated for these patients. Otolaryngologist consultation also should be ordered if fungal infection is suspected. Adams WG, Deaver KA, Cochi SL, Plikaytis BD, Zell ER, Broome CV, et al. Decline of childhood Haemophilus influenzae type b (Hib) disease in the Hib vaccine era. JAMA. 1993 Jan 13. 269(2):221-6. [Medline]. Ambati BK, Ambati J, Azar N, Stratton L, Schmidt EV. Periorbital and orbital cellulitis before and after the advent of Haemophilus influenzae type B vaccination. Ophthalmology. 2000 Aug. 107(8):1450-3. [Medline]. Barone SR, Aiuto LT. Periorbital and orbital cellulitis in the Haemophilus influenzae vaccine era. J Pediatr Ophthalmol Strabismus. 1997 Sep-Oct. 34(5):293-6. [Medline]. Donahue SP, Schwartz G. Preseptal and orbital cellulitis in childhood. A changing microbiologic spectrum. Ophthalmology. 1998 Oct. 105(10):1902-5; discussion 1905-6. [Medline]. Artac H, Silahli M, Keles S, Ozdemir M, Reisli I. A rare cause of preseptal cellulitis: anthrax. Pediatr Dermatol. 2007 May-Jun. 24(3):330-1. [Medline]. Hu G, Wang MJ, Miller MJ, Holland GN, Bruckner DA, Civen R, et al. Ocular vaccinia following exposure to a smallpox vaccinee. Am J Ophthalmol. 2004 Mar. 137(3):554-6. [Medline]. Soysal HG, Kiratli H, Recep OF. Anthrax as the cause of preseptal cellulitis and cicatricial ectropion. Acta Ophthalmol Scand. 2001 Apr. 79(2):208-9. [Medline]. Babar TF, Zaman M, Khan MN, Khan MD. Risk factors of preseptal and orbital cellulitis. J Coll Physicians Surg Pak. 2009 Jan. 19(1):39-42. [Medline]. Chaudhry IA, Shamsi FA, Elzaridi E, Al-Rashed W, Al-Amri A, Arat YO. Inpatient preseptal cellulitis: experience from a tertiary eye care centre. Br J Ophthalmol. 2008 Oct. 92(10):1337-41. [Medline]. McCarty ML, Wilson MW, Fleming JC, Thompson JW, Sandlund JT, Flynn PM, et al. Manifestations of fungal cellulitis of the orbit in children with neutropenia and fever. Ophthal Plast Reconstr Surg. 2004 May. 20(3):217-23. [Medline]. Reynolds DJ, Kodsi SR, Rubin SE, Rodgers IR. Intracranial infection associated with preseptal and orbital cellulitis in the pediatric patient. J AAPOS. 2003 Dec. 7(6):413-7. [Medline]. Murthum K, Pogorelov P, Bergua A. [Preseptal cellulitis as a complication of surgical treatment of migraine headaches]. Klin Monatsbl Augenheilkd. 2009 Jul. 226(7):572-3. [Medline]. Agarwal M, Biswas J, S K, Shanmugam MP. Retinoblastoma presenting as orbital cellulitis: report of four cases with a review of the literature. Orbit. 2004 Jun. 23(2):93-8. [Medline]. Jacobs D, Galetta S. Diagnosis and management of orbital pseudotumor. Curr Opin Ophthalmol. 2002 Dec. 13(6):347-51. [Medline]. Finger Basak SA, Berk DR, Lueder GT, Bayliss SJ. Common features of periocular tinea. Arch Ophthalmol. 2011 Mar. 129(3):306-9. [Medline]. Borschitz T, Schlicht S, Siegel E, Hanke E, von Stebut E. Improvement of a Clinical Score for Necrotizing Fasciitis: 'Pain Out of Proportion' and High CRP Levels Aid the Diagnosis. PLoS One. 2015. 10 (7):e0132775. [Medline]. Ho CF, Huang YC, Wang CJ, Chiu CH, Lin TY. Clinical analysis of computed tomography-staged orbital cellulitis in children. J Microbiol Immunol Infect. 2007 Dec. 40(6):518-24. [Medline]. Eustis HS, Armstrong DC, Buncic JR, Morin JD. Staging of orbital cellulitis in children: computerized tomography characteristics and treatment guidelines. J Pediatr Ophthalmol Strabismus. 1986 Sep-Oct. 23(5):246-51. [Medline]. Sepahdari AR, Aakalu VK, Kapur R, Michals EA, Saran N, French A, et al. MRI of orbital cellulitis and orbital abscess: the role of diffusion-weighted imaging. AJR Am J Roentgenol. 2009 Sep. 193 (3):W244-50. [Medline]. Liu IT, Kao SC, Wang AG, Tsai CC, Liang CK, Hsu WM. Preseptal and orbital cellulitis: a 10-year review of hospitalized patients. J Chin Med Assoc. 2006 Sep. 69(9):415-22. [Medline]. Bababeygy SR, Silva RA, Sun Y, Jain A. Rifampin and linezolid in the treatment of methicillin-resistant Staphylococcus aureus preseptal cellulitis. Ophthal Plast Reconstr Surg. 2009 May-Jun. 25 (3):227-8. [Medline]. Yang M, Quah BL, Seah LL, Looi A. Orbital cellulitis in children-medical treatment versus surgical management. Orbit. 2009. 28(2-3):124-36. [Medline]. Brugha RE, Abrahamson E. Ambulatory intravenous antibiotic therapy for children with preseptal cellulitis. Pediatr Emerg Care. 2012 Mar. 28 (3):226-8. [Medline]. 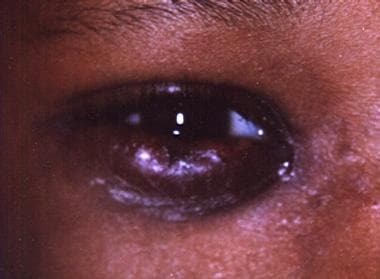 This image shows a 10-year-old child who presented with fever, acute unilateral eyelid erythema, and limited extraocular motions. The presentation is suspicious for orbital cellulitis.